The joy of watching birds is something that many people enjoy and one of the ways to attract them to your home is by offering them an easy meal. Bird feeders are great garden additions because they are safe on birds and can keep them well-nourished. However, they need to be maintained in good condition and the following are a few tips that can help to keep them in place for years. Try to stick to a regular cleaning regime of at least once a week. Remove any loose debris that has collected on the feeder surface and then scrub it. This should clean any accumulated bird droppings, which can carry infection and cause damage to the feeder if left in place. Brush the area below to clear away any spilled food as this can attract rodents that may then try to get onto the feeder. The first thing is obviously to have a good quality bird feeder in place. Whether you buy one or build it yourself, make sure it is well constructed from solid materials that are capable of dealing with the elements. Wood and metal models are a good option and should easily cope with the rigors of being outside. In the first few weeks and months of using a feeder try to get a feel for putting out just enough food and seeds each day to make sure that everything is eaten. This avoids it spoiling and going bad, which can be unhealthy for the birds and damage the feeder. With a little attention, it should be possible to learn just how much is enough to ensure that food is not left to rot and cause problems. Putting in place and maintaining guards against unwanted guests such as rats or squirrels is also sensible. They can cause a lot of damage and even destroy a feeder if they get onto it looking for easy food. Providing local birds with a meal can help them and this is especially so during the harsher times of the year when food is scarce. 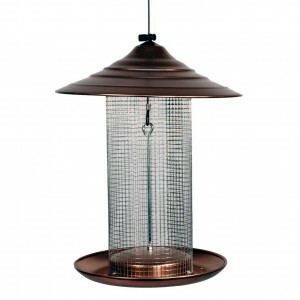 A bird feeder is the simplest option for this and should attract plenty of flying visitors to your garden. The tips above will help keep it in good condition, so you can enjoy many years of bird watching from the comfort of your home. So true. Honesty and everything regdinczeo.